Uh, yeah, so that happened. Ice cream sandwiches. Like, whoa. The first time I went to Tacofino, I went to their commissary, not their food truck. We went with another couple and when it came to dessert, one friend made the call to order every single dessert on the menu. It was an odd call, since we rarely order dessert, but it was also the best call to make. They only had 4 or 5 different sweet things, but we were that table at the restaurant. It was a little embarrassing having all the nearby tables gawk as every dessert item found a home on our table. But it was also fun and clearly a delicious time. One of the desserts was their diablo cookie which they turned into an ice cream sandwich. I liked it a lot. I saw Julie’s post about Tacofino’s Diablo Cookies and knew I wanted to make them. But unlike Julie, I like spice in my cookies, so I followed the original recipe. I didn’t find them super spicy, but if that’s your deal, feel free to add in an extra teaspoon of cayenne. If you don’t care for heady spicy spices, make Julie’s angelic version here. The cookies are easy to whip up. They call for vegetable oil, not butter, which makes them so much easier in terms of prep. Except I was out of sugar, cocoa and eggs. Doh! I ran out to the store anyway because these cookies were calling out to be baked. On a hot summer afternoon without air conditioning. Trust me, they’re good. But they got better. Take 2 cookies, add ice cream. The day after I made these cookies, I had some friends over for dinner – the same friends who ordered all the Tacofino desserts. I served the ice cream sandwiches for dessert and my friends thought they were even better than the ones served at the restaurant. I think it was the addition of the salted tops. Seriously, do not forget the salt here. It adds a salty ying to the chocolate yang. Skip the cayenne if it ain’t your thing, but don’t skip the salt. That’s an order. 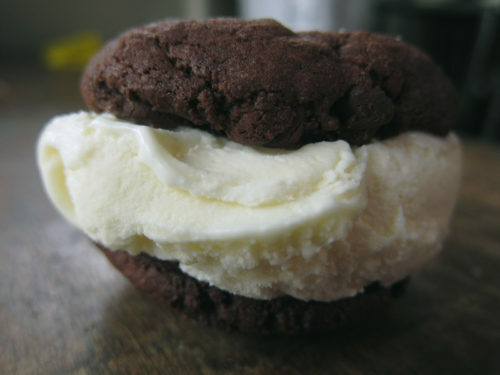 For those of you who have bad luck with ice cream sandwiches (okay, maybe it’s just me), here are my tips. 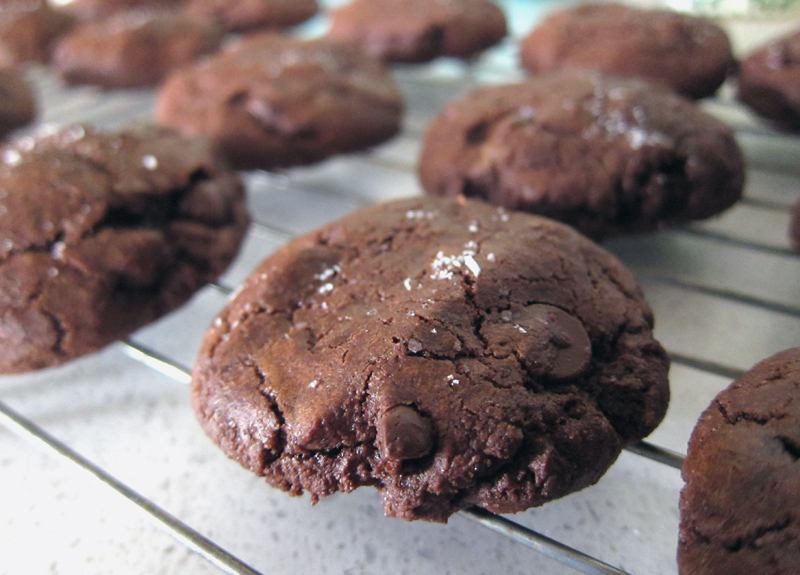 First, your cookies should be of the chewy variety, that’s why these fudgey ones work so well. Also, make sure your cookies have cooled down. Like totally cool. This is a no-brainer, but it needs to be said. Make sure your ice cream isn’t rock hard – let it sit a bit so it’s more scoop-able and smush-worthy. The final step is once you’ve sandwiched your cookies with ice cream, wrap them up tightly with plastic wrap and put them in the freezer to chill for a couple hours. They need time to set so they don’t go completely squishy once you bite into them. The cookies are delicious on their own. 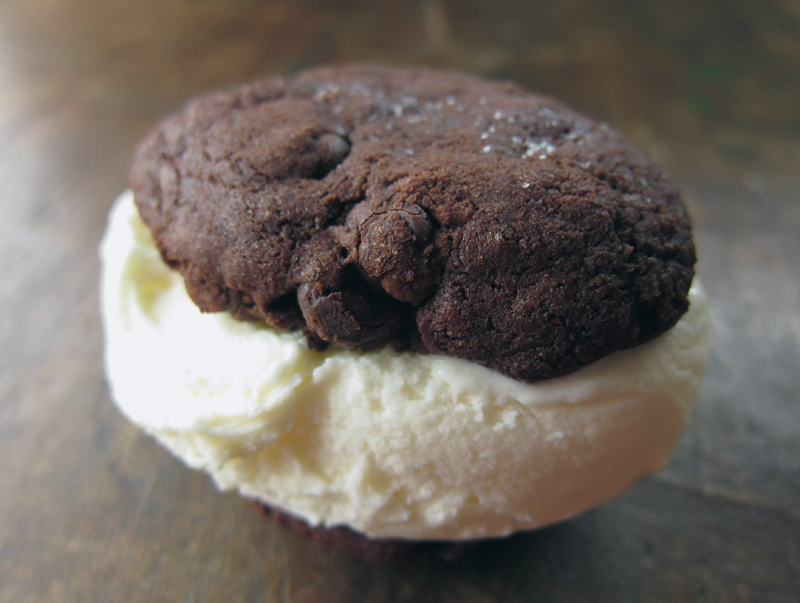 But go ahead and turn them into ice cream sandwiches – read my tips above. You’re welcome. In a medium sized bowl, whisk together the flour, cocoa, baking soda, cinnamon, cayenne and salt together until blended. Set aside. In a large bowl, mix together the 2 sugars, the oil, eggs, vanilla, and ginger. Slowly stir in the flour mixture along with the chocolate chips until you’ve got a thick, heavy dough. Prep your cookie sheets with either parchment or silpat liners and use a tablespoon to drop the cookies onto the sheet. I was able to fit 12 cookies per tray with about a 1.5″ gap between each cookie. Press the tops flat with your hands and sprinkle with kosher or fleur de sel. Bake for 11-15 minutes, or until the tops crackle but are still fudgey in the middle. Once the cookies are out of the oven, let them set on the sheets for a minute or two before transferring to racks to completely cool. 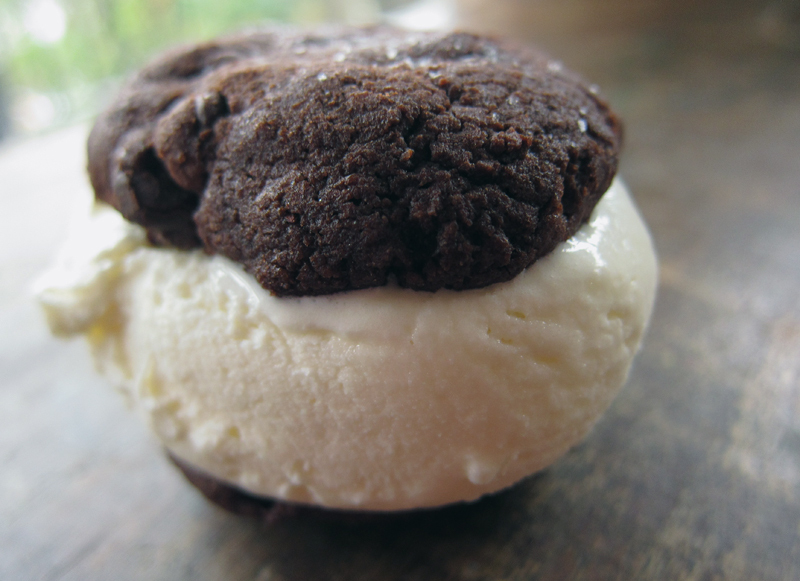 To assemble the ice cream sandwiches, add a small scoop of vanilla ice cream to the cookie bottom. 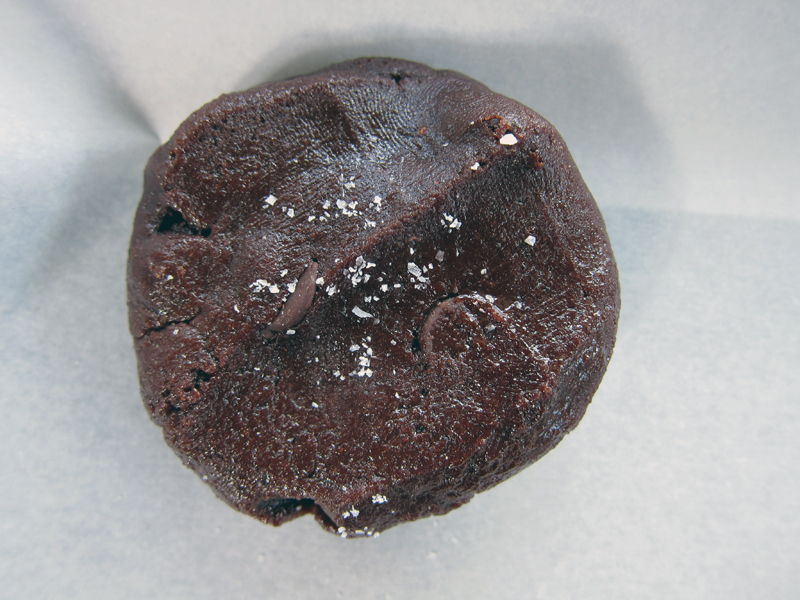 Gently press a second cookie into the ice cream so that the salted tops face outward. Wrap each sandwich in plastic wrap and freeze until ready to serve. Makes approx. 12 ice cream sandwiches or 24 cookies. Dang, this is definitely what I need right now. It looks awesome! These look awesome! They look like the perfect ice cream sandwich cookies! Just soft enough. Yum! Oh my goodness! I LOVE ice cream sandwiches…and these sound great. I have had the Tacofino cookie before and found it a bit spicy…but I think when it is paired with cooling ice cream it might just really work! I even made an ice cream sandwich for myself last week (not as successful as yours!) that was how strong the craving was! This obsession with ice cream sandwiches started earlier this summer when I bought one from Brown Paper Packages Ice Cream at a farmer’s market – Caramel apple ice cream with a chewy caramel cookie. Yum! I’ve never made ice cream sandwiches before and I have been wanting to do it all summer after seeing photos on Pinterest. Thanks for the reminder! No A/C in your condo? I know the feeling, I don’t have it at my home either and we’re going through another heat wave this week…32C today! I hate to admit to it but I think I’m ready for crisper fall weather now. I kinda love that you guys ordered every dessert off the menu! I need to do things like that more often…I’d be much more satisfied after meals out. 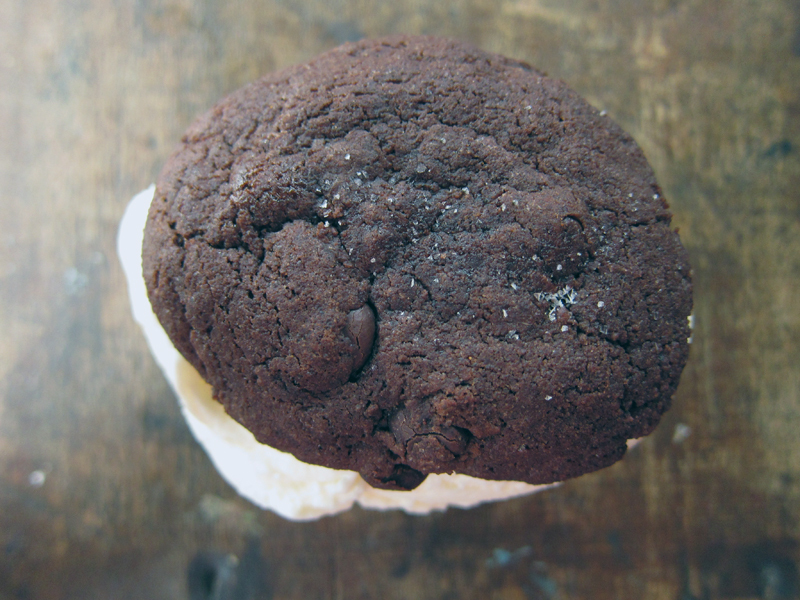 The spicy cookie with the vanilla ice cream sounds like the perfect compliment. Katrina, oh, it is awesome 🙂 Thanks! Hag, I didn’t find these too spicy, though you could leave out or just reduce the amount of cayenne. The fresh ginger leaves a big amount of spice too which is nice! I’ll have to track down one of those ice cream sandwiches at the market! Bijoux, there’s no need for A/C in Vancouver. I don’t know a single home that has it. Vancouver summers are no way near as hot and humid as the Ontario summers I grew up in. As for desserts, we all shared them but it was fun! I am so making these! But I have to ask if the one Tablespoon of vanilla was a typo? 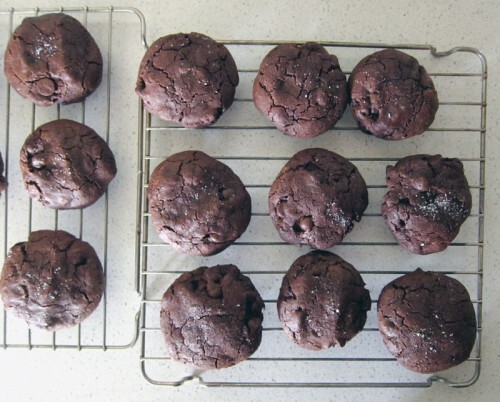 For a recipe making only 24 cookies that seems like a lot. Things that I love: spice. chocolate. cookies. sweet & salty. These cookies are a dream come true! Oh my lord, these are calling to me. Screaming, actually. Going on the to-do list for this weekend! Hell yes! These look awesome! And I like yo tips! Because I mean, I can’t do that cut ice cream circles out thing. Turns into a melty disaster! And you’re so right. Never ever forget the salt! Yes, Amanda, please let me know if you give them a try. I loved them. I love a good ice cream sandwich and these sound incredible! They’re now on my “must make before the end of summer” list! Jacqui, I hope you give them a go, they’d be a great end to summer 2013! Totally brilliant! The heat of the chili would totally be offset by the cool ice cream. So yum. I just made them today and they are so very yummy! They never made it to the ice cream stage. Most of the cookies disappeared off the cooling rack. Love the spicy from the cayenne and the ginger! Thanks Julie for providing the inspiration for these! !